This blog entry about the events of Wednesday, June 29, 2011 was originally posted on July 07, 2011. PART 12 (DAY 14): “We’re gonna die!! !” cried a little boy in blue, running out of the Devil’s Garden Trail in the northern area of Arches National Park. Little Boy Blue was literally crying — and figuratively shitting a brick — as the Devil summoned large raindrops, lightning bolts so crazy they formed electrical tributaries in the sky, and a powerful wind that created a sandstorm in our faces as we ran out to escape the narrow canyon. “I don’t want to die!” he yelled as he clenched onto his father for dear life. “WHAT’S THE MATTER WITH YOU?” Cheryl questioned me as we departed Arches NP to escape the storm. I was disheveled as an old fart, after running towards the car in the downpour. In the process, I’d lost my sunglasses, plus the spare car key to Cheryl’s car. On top of that I was wet, getting a little claustrophobic in the dampness, and a little anxious over the email of a small emergency I had to take care of for a freelance job. Plus, the digital camera that I bought to temporarily substitute the one that got waterlogged in Turkey a few weeks prior (I was going to return it to Target after my original got repaired) got scratched up and visibly unreturnable. “You’re like an old man today,” Cheryl continued. Fortunately the storm started to clear as we head south and the key was found; it had fallen to the side of the seat after all. My spirits were coming up, but perhaps that was partly due to my company and the bag of Doritos in the car. “Help me eat these,” Cheryl invited me, who had a weakness for Doritos despite her determination to eat healthy. While that may seem like a gratuitous plug (it’s not), we were soon faced with a blatant form of advertising painted on the side of a huge boulder. This HOLE IN” THE ROCK was an obvious tourist trap (but not for unruly children) — complete with an adjacent petting zoo and a gift shop of kitsch — but one we were recommended by Andy (Cheryl’s boyfriend) to check out. The dynamite-carved cavern was once a vintage diner-turned-5000 sq ft. home of the Christensen family, who have since passed on and have left their legacy to be in the pages of Roadside American history. There were better tourist traps to be seen — two well-known ones actually — found in and around Navajo Nation, the vast Indian reservation territory spanning parts of Utah, Colorado, Arizona, and New Mexico. In fact, where those four states meet in a nice right-angled intersction is the Four Corners Monument, which wouldn’t be much if it wasn’t denoted by flags of the four states, the USA, and the Navajo — plus the line of tourists who pay to do the ritual of having an appendage in each of the four states at the same time. Although the U.S. Department of the Interior declares the spot as the true intersection, my iPhone’s GPS positioning showed that it was slightly off — but it’s the thought that counts. “Should we get a Navajo Taco?” I asked Cheryl; it was the only other interesting thing that caught my eye at the Navajo “monument” amidst the stalls of Indian handicrafts. “Well that took five minutes,” Cheryl said as we finished our food, leaving the secluded monument miles away from any town, after only a short period of time. “Yeah, they really should build a casino here,” I said. HARRY BELAFONTE’S PURE GOLD (the “official” road tripping album of the Trinidad family for decades) took us out of the four states and through just one: Arizona. “It’s lookin’ more like Monument Valley!” Cheryl proclaimed in the way that she does about things, as she saw more and more big rocks that jut out of the desert like petrified cathedrals. Highway 163 took us northbound from Kayenta, AZ and back a little bit back over the Utah border to where the famed collection of rocks known as Monument Valley stood like skyscrapers along a lonely road in the desert. We recognized them right away; they were made famous by John Wayne in Stagecoach, but have been seen in Easy Rider, Once Upon A Time In The West, National Lampoon’s Vacation, Vertical Limit, Back to the Future III, and Forrest Gump. The vantage point of where the “classic” shot is was hard to find as we drove to the different pulloffs in the area, but perhaps it was looking off to us because we didn’t have the optimal red light sun effects of sunrise or sunset. We accidentally drove through some Navajo neighborhood of dirt roads, but got back on track to the main paved road, Hwy-163, which wasn’t as straight as we remembered from movies, at least on the south end where we didn’t have the sun glaring in our eyes. 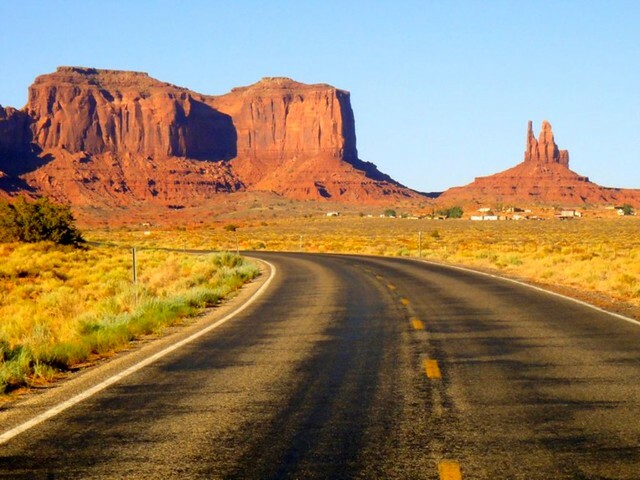 The road after all, is just as much as an icon as the rocks that tower next to it, if not for possibly being featured in Road Runner cartoons, but as being as the location where Forrest Gump ended his back-and-forth cross-country running streak. “Was that a Forrest Gump reference?” Cheryl asked. “Both,” I answered. I turned to a faraway bush, and peed. “Home” for us that night and the following morning was in Tuba City, AZ, one of the bigger towns within Navajo Nation, a town not unlike other ones outside the Indian reservation; the Navajo people around us drove American pick-up trucks, wore cowboy hats, ran their own police department, went to the grocery, and sang bad karaoke — just like us! In Tuba City, there was also a McDonald’s, a Sonic, and the Quality Inn we stayed for the night. The hotel was actually the most “native” of the American chains there, proudly operated and decorated by members of the Navajo Nation. Next door at the adjacent Hogan’s restaurant, they even served authentic Navajo fare. “Wow, they really push the fry bread here,” I noticed, reading the menu. All the burgers and sandwiches could optionally be served on Navajo Fry Bread instead of not-fried bread (at “No extra charge!”) in case you were feeling natively in the mood for gratuitous grease. I had a piece of it of course, with the authentic Mutton Stew with Fresh Garden Vegetables — “a Navajo Family Favorite” — which turned out to be really bland, even with the Fry Bread. I wished I had a bag of Doritos. Doritos would be in our future though, as we put the monuments of Navajo Nation behind us and continued our road trip towards California — but not without stopping in at one more “grand” tourist attraction. The rest are coming slowly but surely. yes, we used to rock Day-O and Jump in the Line, way before Lil Wayne sampled Day-O….